Silverpoint is an ancient drawing medium used extensively during the Renaissance. Essentially, silverpoint drawing is based on a prepared Gesso surface upon which the artist draws with a fine silver stylus. Other "metalpoint" media are gold, copper, aluminum, brass and platinum. 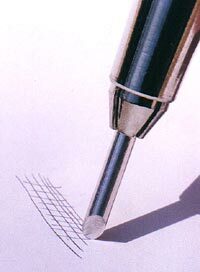 A contemporary silverpoint tool comprises a standard draftsman's mechanical pencil. Instead of graphite "leads", the artist inserts a sterling silver rod or wire of about 2mm in width. A fine metal file or a standard knife sharpening stone keeps the point relatively sharp. Care must be taken to prepare the surface to accept silverpoint. A contemporary ground for silverpoint drawing is a standard acrylic Gesso primer applied to paper or panel in multiple layers. The final layer is sanded smooth. When first applying silver to a properly prepared panel or paper, the drawing leaves a grayish line. In turn, these lines tarnish over time giving the drawing a unique mature look. Today silverpoint work enjoys public appreciation and awareness. Doug began using silverpoint for some of his drawings in 1978. The unforgiving nature of silverpoint, demanding control and discipline, make this medium an excellent teaching tool. Doug says drawing with silverpoint makes him feel "connected" to the work of centuries ago.